GBC offers a new way to bind your documents for the office! GBC ProClick is secure but also allows easy editing. 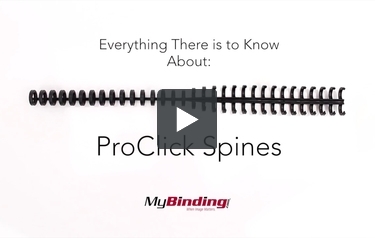 They are a 3:1 pitch (meaning 32 holes), and the spines simply snap close and zip open. So if you need some quick editing on the go, anyone can add in or remove papers! We have them available in four different colors-white, black, navy blue, and frosted. We sell them as individual spines, cartridges for easy heavy quantity binding, half sizes, and kits. We also sell the zipper tools that will be necessary to edit and open the spine. Make sure you have a 3"1 pitch ProClick machine, too!